The 4 Channel Strain Gauge CAN controller accepts up to four 4-wire strain gauge connections. The input range is user selectable from +/- 19.5 mV to +/- 2.5 Vdc. It interfaces with the machine’s CAN network (SAE J1939). The measurement rate is 2.5 scans per second and the update rate is 400 ms for all 4 channels. Standard embedded software is provided. 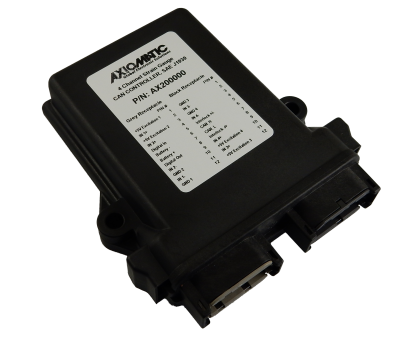 Rugged IP67 rated packaging and a power supply input of 12Vdc or 24Vdc nominal suits applications in the harsh environment of mobile equipment with on-board battery power. All setpoints are user configurable using the Electronic Assistant®. The input range is user selectable from +/- 19.5 mV to +/- 2.5 Vdc.